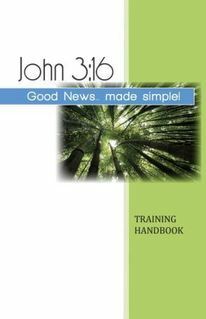 Evangelism Training Tools - Christian Witnessing: Evangelism Training & Tools to Share Your Faith: "JOHN 3:16 Good News...made simple!" *Use these materials if you CAN NOT print handbooks or show powerpoint slides electronically. *Use these materials if you CAN print handbooks or show powerpoint slides electronically. Coordinates with PowerPoint and Leaders Guide. During a Workshop or small group study. Use with PowerPoint and Training Handbook. Provides suggestions and tips for conducting a successful workshop or small group study. Especially designed for those facilitating for the first time. 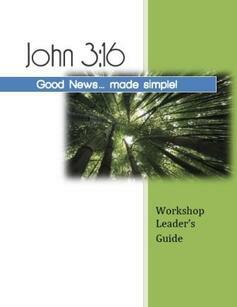 Use to lead a Workshop or Small Group study. Coordinates with Training Handbook and Leaders Guide. 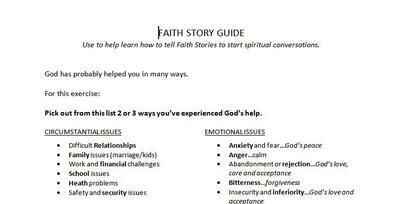 Participants learning tool during Lesson 2 - Starting Spiritual Conversations to help learn how to tell FAITH STORIES. Bring the mention of God into your conversation "naturally"
Participants learning tool during Lession 3 - Explaining the Gospel Using John 3:16. Jot down key words or notes in the boxes provided. Helps to structure what you want to say. 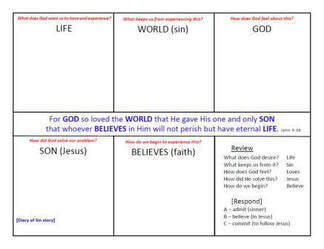 5 boxes - one for each of the 5 questions used while explaining the Gospel. Materials are FREE to download for personal or group use.